Vincent G. Robertson | Parkowski, Guerke & Swayze, P.A. 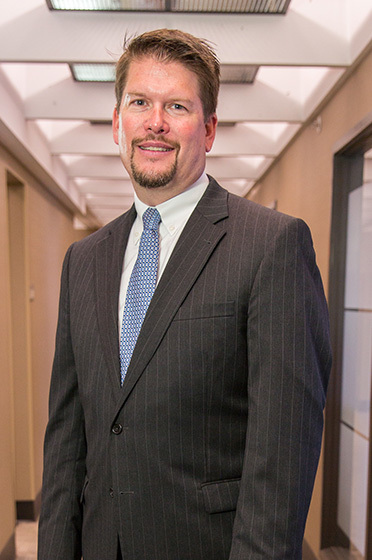 Vincent G. Robertson joined Parkowski Guerke & Swayze in January of 2017 as a Director, as part of Griffin & Robertson’s merger into the firm. Prior to Parkowski, Guerke & Swayze, Mr. Robertson practiced with Griffin & Robertson (formerly Griffin & Hackett) since 1994, becoming a partner there in 2003. His areas of practice are primarily concentrated in governmental and administrative matters, zoning, commercial and residential real estate, liquor licenses, land use litigation and eminent domain litigation. Mr. Robertson was admitted to the Delaware Bar in December of 1994, and is a member of the Delaware and Sussex County Bar Associations. He is also admitted to practice before the U.S. District for the District of Delaware. He has served as a Secretary of the Sussex County Bar Association and is a past member of the Delaware Board of Bar Examiners. Other affiliations include past membership on the Council of the Delaware Association of Professional Engineers where he served as Secretary of that organization from 2005 through 2008. He was also a board member of Sussex County Habitat for Humanity, and still remains active with that organization. He is also currently the President of the Cape Henlopen Boys Varsity Basketball Boosters. Representative clients include Sussex County, where Mr. Robertson has served as Assistant County Attorney since 2003. Although he is involved in nearly all types of legal matters affecting Sussex County, his primary areas of responsibility include the Planning and Zoning Commission and the Engineering Department. Mr. Robertson also represents the Delaware Department of Transportation with regard to land acquisition matters in the southern portion of Delaware. Other clients include the SoDel Restaurant Group (Owners of Bluecoast, Fish On, Papa Grande’s and others), Capstone Homes, Arena’s Restaurants and many other large and small clients. Mr. Robertson graduated from The University of Delaware in 1991 with a Bachelor of Arts Degree. He next attended the University of Louisville School of Law, receiving his J.D. in May of 1994. While attending the University of Louisville, he was a member of the Law Review. He lives in Lewes and Rehoboth with his wife and two sons.